The Spy Recovery Pro is the ultimate data recovery and data monitoring tool. 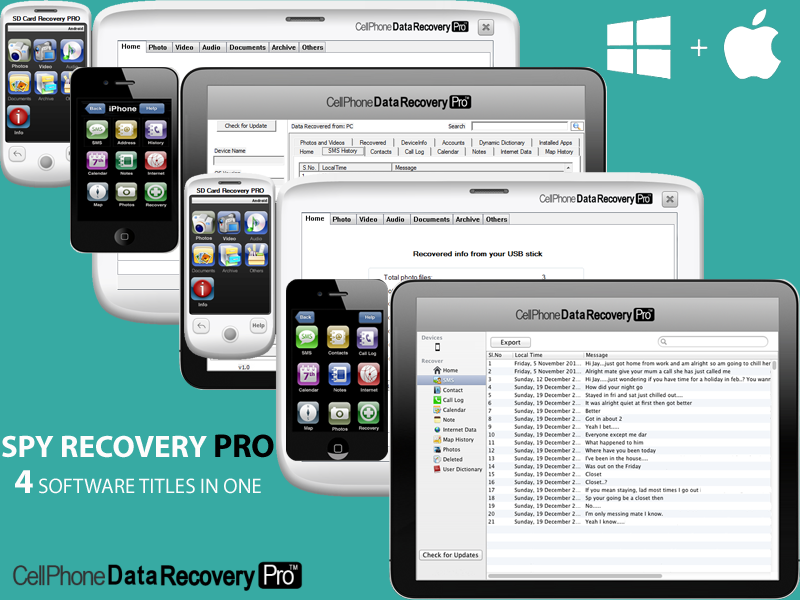 This combination software offers 4 different recovery tools in one product. You can recover deleted data and monitor data on a range of devices, including iPhone, iPad, iPod Touch, Android devices, SD Cards and USB Flash Drives. The software is all compatible with Windows PCs and Mac. Option also available for iOS recovery. The software is installed on one CDROM; for access to the data you need simply enter the activation code provided with the product. The Spy Recovery Pro can be used on an unlimited number of compatible devices, providing a genuine saving compared to if these software titles were purchased individually. The CDR 500 is a collection of the ultimate spy and parental control tools. You can bring back deleted data of your children or spouses phone or memory sticks. By doing so, children can be protected from bullies and harm. Spouses can remove any suspicion or in some unfortunate cases establish infidelity. For iOS recovery, the CDR500 can recover lost and deleted SMS Text Messages, iMessages, Contacts, Notes, Call history and Calendar entries. It can also retrieve Photos, Videos, Internet history and Map history. For Android phones, CDR 500 can recover lost and deleted SMS, photos, videos, audios and documents. It can retrieve SMS/Text Messages, Contacts, Call Log, Calendar Items, Calendar, Account Settings, Videos, Internet History / Bookmarks, Device Properties, Graphics/Photos and Text. For SD Cards, CDR 500 can recover Photos, Videos, Audio, Archive files and Documents. For USB and flash/pen drives, CDR 500 can recover Photos, Videos, Archive files, Audio and Documents. By clicking add to cart, you agree to the terms of sale & shown decription for this product.